For bulk orders, contact Green Books. 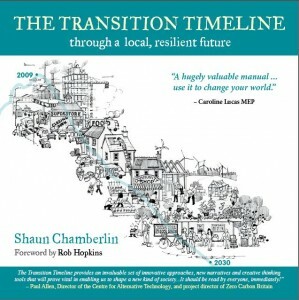 The Transition Timeline: for a local, resilient future. By Shaun Chamberlin. Green Books. 2009. Paul Allen, Director, Centre for Alternative Technology. The Transition Timeline lightens the fear of our uncertain future, providing a map of what we are facing and the different pathways available to us. It describes four possible scenarios for the UK and world over the next twenty years, ranging from Denial, in which we reap the consequences of failing to acknowledge and respond to our environmental challenges, to the Transition Vision, in which we shift our cultural assumptions to fit our circumstances and move into a more fulfilling, lower-energy world. The practical, realistic details of this Transition Vision are examined in depth, covering key areas such as food, energy, demographics, transport and healthcare, and they provide a sense of context for communities working towards a thriving future. “Peak oil and climate change are two of the greatest challenges we face today; the Transition Town movement is firmly rooted in the idea that people taking action now in their communities can not only tackle these environmental threats but also, in the process of doing so, lead more fulfilling lives. It is about hope in an otherwise bleak seeming future. Above all, it’s about the power of an alternative vision for how society could be and not waiting for government or politicians to get it right. Caroline Lucas MEP, leader of the Green Party of England and Wales, and co-author of Green Alternatives to Globalisation: A Manifesto. “Shaun Chamberlin ties down the uncertainties about climate, energy, food, water and population, the big scene-setters of our future, with no-nonsense authority. What we get with The Transition Timeline is a map of the landscape we have to find a way through. Map-making is a risky business: sooner or later someone is going to use your map and come across a treacherous swamp that isn’t marked. So you need to be alert to revisions and reports from travellers. But what matters is that someone has got the key characteristics of the landscape drawn out. This is what we have to make sense of – not in the distant future, but right now. “Will the future be as rosy as The Transition Timeline suggests it might be? Will the people of Britain and the rest of the world begin immediately to make better decisions, taking the welfare of future generations into account? The answer to both questions is probably no. Will serious repercussions of decisions already taken (regarding fossil fuel consumption and the structuring of our economy to depend on perpetual growth for its viability) come to bite us hard before we even have a chance to implement some of the excellent recommendations contained in this book? The answer to that one is certainly yes–we are already seeing dire consequences of past economic and energy decisions.